With some success at making flaky tart shells last week for the Banana Cream Pie, I saved an extra batch of the tart dough for this week’s attempt at Mushroom Leek Tart. It saves so much time to have the tart dough handy. 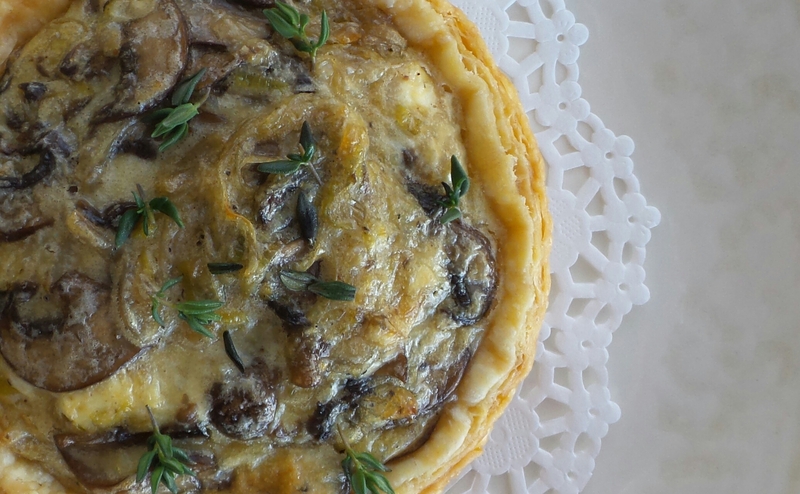 I adjusted the Tartine’s Wild Mushroom Tart recipe to incorporate leek into the tart filing. We enjoyed the yummy tarts for breakfast. Delicious! Follow Flaky Tart Dough recipe for Banana Cream Pie. I froze excess dough from last week in the freezer. Thaw frozen dough in refrigerator overnight. Divide tart dough into 6 equal portions of half-inch discs. Take each disc out of the refrigerator, one at a time. Roll each disc into a 6″ circle. Lay the disc over the tart mold. Press the dough into the mold and crimp the edges. Keep the tart pan in the refrigerator while working on the next disc. Repeat for the number of tarts desired. Prick the bottom of each tart with a fork to release the heat during baking. Bake in 375 degree F oven until the bottom of the tart starts to brown, approximately 20 minutes. Check during baking. If the bottom of the tart begins to rise, prick with a sharp knife to release the heat. 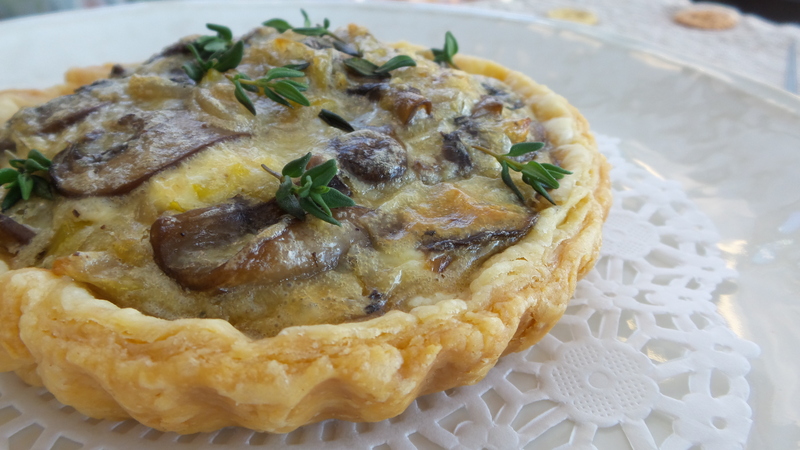 Remove the tart shells from the oven and brush the bottom of each tart generously with egg white. Return to the oven for another 5 minutes to set the egg white. Remove the tart shells from the oven and cool. The tart shells are ready to use. Melt 2 Tbsp butter over medium heat in a large skillet. Add the sliced shallots and fry for 3 minutes until the shallots is soft and translucent. Add the sliced leek and continue to fry for another 3-5 minutes until the shallot and leek mixture is soft and starts to turn brown. Transfer to a plate. Melt the other 2 Tbsp butter over medium heat in the skillet. Add the mushroom and saute the mushrooms for another 5 minutes until the mushrooms are soft and the liquid has evaporated. Beat the egg yolks, salt, nutmeg, black pepper with 1/2 cup heavy cream and 1/4 cup goat cheese in a large mixing bowl until smooth. Stir in the mushrooms, shallots, and leek. Divide the filling among the 6 partially baked tart shells. Bake in the 375 degree F oven for another 20 minutes until the filling is set and the tart shells turned golden brown. Remove the tartlets from the tart pan and cool for 5 minutes on a wire rack. Sprinkle with chopped fresh thyme. Serve warm.